Providing you the best range of solar power plant structure, solar panel mounting structure, solar structure galvanized services and solar panel stand with effective & timely delivery. With the aid of our highly experienced professionals, we are instrumental in developing premium grade Solar Power Plant. Due to the increased awareness of solar energy the offered structures are becoming widely popular across the residential, commercial and industry sectors. We have invested in full fledged manufacturing facilities to present the hot dip galvanized structures for solar power plants. The offered range comprises of industry compliant designs of C lip, Z purlin, rafter, bracing and bottom legs that can be availed from us in customized sizes at a nominal price. Our offered structures are mainly used in power grid fittings and widely appreciated by our prestigious clients for their precise design and easy installation. These structures can also be availed in various sizes, designs and other related specifications. Our provided structures are manufactured by a team of our adept professionals utilizing quality approved stainless steel and advanced technology. 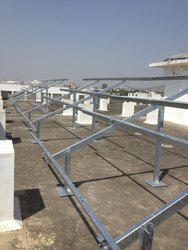 We offer our clients Solar Structure Galvanized Services at Reasonable Prices across India. Solar Power PlantWe are a leading Manufacturer of solar panel stand, solar power plant, solar tracker, off grid solar power plant, solar panel mounting structure and solar roof tops from Rajkot (Guj) , India. 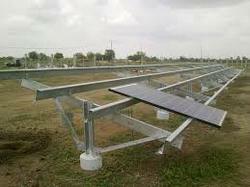 We are the leading supplier of Solar panel stand made from high quality material at competitive prices.